Someone owes you money. Maybe it’s a landlord/tenant issue, damage to your property, a defective product, car accident, breach of contract, or something else. Before you get a lawyer, maybe you want to try to handle it on your own. Learn the elements of a strong demand letter that can get you paid what you’re owed without going to court. A demand payment letter puts an individual or company on notice that you’re considering legal action against them. Most people hire a lawyer to write their demand letters, but you can write it yourself. First, check the rules of the state or local courts where you’re planning to sue, just to make sure that you’re not required to have an attorney present the letter. Why write a demand letter? A demand letter serves a few purposes. You write it to let a person or company know that they (or it) owes you money and that you intend to collect. The best outcome of a demand letter is that once the person or company is put on notice, they’ll simply pay what’s owed to you and you never have to take it any further. This would save you both from the time, effort and money it takes to hire a lawyer and handle the case in court. It’s possible the person or company knows you’re owed the money, but they’ve pushed the issue to the back burner, or they think you’re not planning to move forward with collecting payment. In other words, it might not be a willful refusal to pay. It could be that they’re ignoring you or it’s just low priority. Of course, you’re entitled to collect what you’re owed, so that’s still not an excuse for failing to pay. The second purpose is to set forth exactly what you’re owed and what you expect. If there’s a factual dispute, this might open the door to a negotiation that could also save you from going to court. Don’t assume everyone knows the facts. Even if you think they do, write your version of the facts so that if you end up in court, you have a document that sets forth the nature of the dispute. It should provide enough context for someone unfamiliar with the situation to understand what happened. The facts should include your attempts to resolve the dispute. Refer to email, conversations, or other communications that demonstrate that legal action is the last resort. If there’s evidence (like a contract), you don’t need to include it, but you should refer to it. You need not attach the actual contract in your demand letter, but save it in case you need to use it as evidence in court later on. 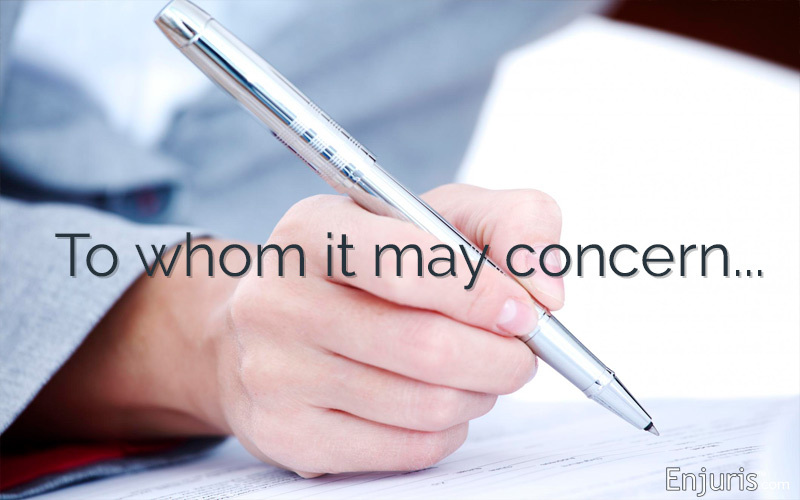 If there’s evidence in the recipient’s possession, mention it in the letter. It’s illegal to destroy evidence, but that doesn’t mean it doesn’t happen. The clearer you are about what the evidence is, how you know the recipient has it or controls it, and why it’s important, the better off you are if you need to explain it in court. If there’s an issue of fact about whether the letter’s recipient is actually at fault for the incident, explain why you believe the recipient owes you this money. State a reasonable deadline based on the amount of money owed. If it’s a large sum of money, you might even offer the possibility of payment installments. Either way, be clear about when and how you expect to be paid. Enjuris tip: Be sure to include in your demand letter how you want to be paid. If you don’t trust a personal check, specify that you want a bank check or cash. You can also include how it’s delivered — maybe you want a certified letter or personal delivery. Be reasonable and clear. Specifically, let the recipient know that if your demands aren’t met, what you are planning to do (i.e., file a lawsuit). Advising the person that you’ll file a lawsuit if your demands aren’t met is acceptable. Any of the other types of threats are not, and you will be in danger of prosecution if you make them. A demand letter is only applicable for a civil lawsuit. A civil case is between a plaintiff and defendant (or multiple plaintiffs and defendants) in which one party sues another to recover monetary damages or property. It’s never a tool to threaten criminal prosecution. Only the government (federal, state, or local) can charge a person with a crime. If you think you’re the victim of a crime, talk to the appropriate law enforcement bureau about how to file charges. Don’t give away the farm. In other words, present exactly what’s necessary to show WHY, HOW, and HOW MUCH you should be owed. If you have evidence that would help your case later but doesn’t need to be included in the demand, then leave it out. Save it in case you do end up going to court. The shorter and clearer the letter is, the more impactful it will be. Be professional. You’re representing yourself, but make it as professional as if a lawyer prepared the letter. Use correct grammar and spelling, and if you have a friend or coworker who can do a quick proofread, that’s always a good idea. Include your full name and address in the header, along with the full name and address of the recipient and the date. There are online templates to guide you through the style of writing a business letter. Read it through the recipient’s eyes. Before you send the letter, read it from the perspective of the recipient. Realize that the person is probably looking for some reason not to pay you, or possibly even a reason to make the issue your fault. Be sure that nothing you’ve written can be used against you. If you’re unsure of whether you are partially at fault, it’s best to consult an attorney and figure that out before you send the letter. Send by certified mail. Certified mail with a return receipt is the best way to send legal correspondence with a guarantee that it was received. Even personal delivery can be questioned. If the person were to claim they didn’t receive it, it would be your word against theirs. When you send by certified mail with a return receipt, the receipt with the recipient’s signature will be mailed back to you. When you get it, keep it in a safe place until the issue is fully resolved. If you fail to reach resolution after sending a demand letter, you could file in small claims court or consult a personal injury attorney. You can still represent yourself without an attorney in small claims court. The advantage is that it requires the defendant to appear in court. If they don’t, a default judgment is rendered in your favor. If you’re unsure about what to include in a demand letter, how to phrase it, or whether you’re making an accurate and compelling argument, consider talking to an attorney. It’s never ideal to go to court — it involves a lot of time and money, and there are no guarantees about the outcome. Fortunately, lawyers knows that, too. Most lawyers want to settle out of court as badly as you do. They’ll write a strong demand letter that might feel more “real” to your opponent coming from a lawyer’s office, and it could encourage faster payment or settlement. If the lawyer’s demand letter doesn’t produce the desired result, they’ll advise you of your next best options moving forward. The Enjuris Law Firm Directory is your first step in finding a lawyer who’ll resolve your dispute, whether it’s from a car accident, defective product, breach of contract, landlord/tenant issue, or anything else. Feel free to download our free checklists to prepare you for that first meeting with your lawyer.